Thank you for the friendly conversation last night in front of the Norwegian Embassy in Vienna. It was a great honor for me to meet you in person. Amy Jakobsen (American citizen) was accused of still breastfeeding her 19-month-old son Tyler, and she was told that the boy should have weighed 10 kg instead of 9.6 kg. But according to weight charts 9.6 kg is a completely normal weight for a 19-month-old child. But Barnevernet employees were convinced they knew better and placed Tyler into a foster family. But why? There was no reason for that. Originally, Amy was allowed to visit Tyler weekly. This was then reduced to bi-weekly visits, and eventually Amy was deprived of all visitation rights in September 2014. The reason according to the case documents is Amy’s American citizenship. The American citizenship is considered as a potential abduction risk. Even the father of the child (Kevin Mossmann, Norwegian citizen!) is not allowed see the child for the same reason. It should be noted that the parents previously were only allowed to see their child at a police station. 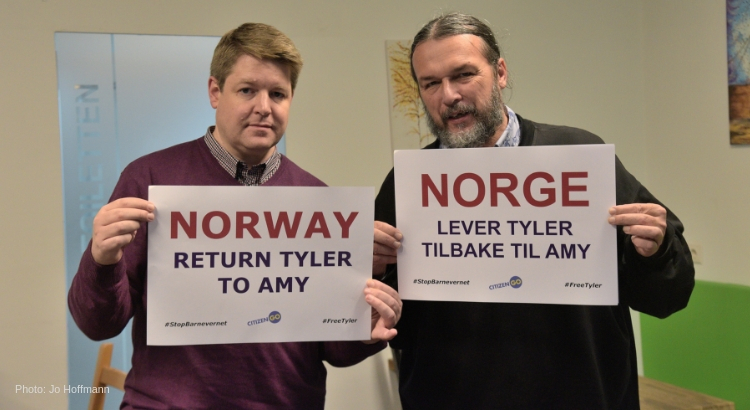 Even Tyler’s name has been changed twice into a Norwegian name, so that the parents won’t be able to locate him. Why are loving parents are being treated so badly? This is a clear case of government overreach. Parental rights and privacy were seriously violated by the Norwegian state. There is also a twofold violation of Article 9 of the UN Convention on the Rights of the Child: children should not be removed from their parents against their will. And if children are separated from one or both parents, they have a right to regular contact with their parents. Tyler has been deprived of this right. We ask you to get Minister Hofstad Helleland aware of this case, as Tyler is now about to get forcibly adopted. She urgently needs to help return Tyler to his parents. The case has already been filed to the European Court of Human Rights in Strasbourg. I am sure you would agree that it can’t be in Norway’s interest to have the European Court intervene in order for the family to get their rights back. 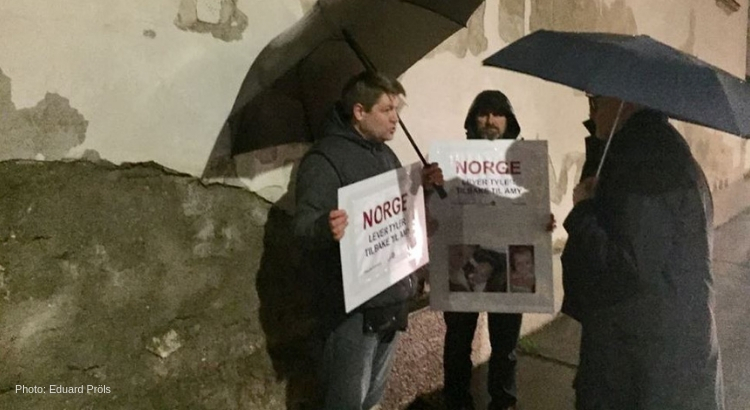 Together with CitizenGO we had called for a silent vigil on Nov. 26th at the Norwegian Embassy in Vienna to support Amy Jakobsen. But because of cold and rainy weather we were only three people who stood near the Embassy. We first thought that nobody would take notice of us. However after 20 mintes two high ranking Gentlemen came out to talk to us. One of them was actually the Counsellor. We explained the case of Amy & Tyler and mentioned that already more than 47,000 people have already signed the petition. The two Gentlemen took photos of our posters and asked us to send further details. This letter has been sent to the Counsellor via mail one day later.